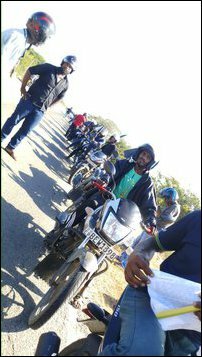 Tension prevailed in Kathira-ve'li, and the surrounding villages located 75 km north of Batticaloa city on Wednesday when Tamil youth went on a motorbike rally opposing the move for mineral excavation by a corporate from the South. 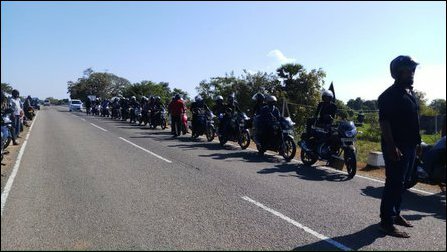 Protesters were riding around 60 motorbikes from Verukal Bridge to Vaakarai through Panichchangkea'ni. 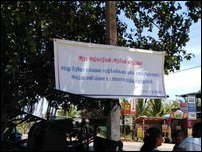 The residents of three villages, Kathirave'li, Puchchang-kea'ni and Puthoor have been protesting against the exploitative ilmenite excavation project launched with the backing of the unitary state of genocidal Sri Lanka. “Now, the people here are outraged, especially the youth. Recently, one youth wanted to self-immolate himself to protect his soil. 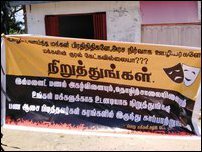 We struggled to stop it,” Kathirve'li Fisheries Society leader M Subramaniyam told TamilNet. “We are finding it difficult to control the youth, and they could resort to extreme response any time,” he warned. 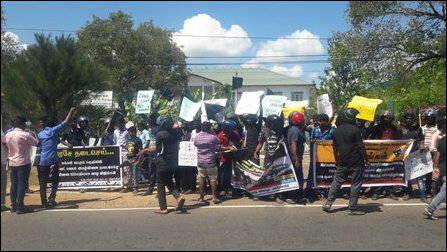 After the end of the genocidal war in Vanni in 2009, the SL State has brought in a private company, Alchemy Heavy Metals Ltd (Mirama Minerals), which owns and operates various mineral mines in the island with a processing plant at Dambulla. The move came after foreign experts carried out a field study from Ka'luvaang-kea'ni to Ilangkaith-thu'rai along the eastern coast. Two hotspots, Kathirave'li (40 acres) and Puchchaak-kea'ni (13 acres), seem to have been identified and allocated to this company. A plant to filter sand is to be set up at Kathirve'li, but most of the excavation is going to target Puchchang-kea'ni, informed Tamil civil sources at the Batticaloa District Secretariat said. The company from South, Alchemy Heavy Metals Ltd (Mirama Minerals), produces garnet, ilmenite, mica, quartz, rutile, and zircon for export. Murugiah Subramaniyam, the chairman of Kathirave'li Fisheries Society, represents one of the eight organisations backing the peoples' campaign against the mining project. He said that the authorities were secretly scheming the mining project without the people of the area providing their acceptance to the project. 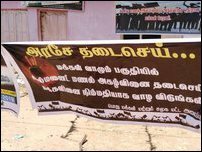 To document that the people had been ‘consulted’, a document from the Rural Development Society has been used by the SL authorities, Mr Subramaniyam told TamilNet on Friday. That document was not signed by the president or the secretary of the RDS, he says. There has been no meeting in support of that document in the RDS. The local authorities coming under the occupying unitary state have got the signature of the treasurer deceptively. At the same time, all opposition expressed by five representatives of various organisations already in a meeting with the Divisional Secretary in October and November 2011 have been systematically excluded in the documentation, he says. 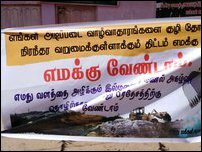 Subramaniyam himself had given a letter on behalf of the fisheries society that the people were opposed to the project. There have been protests one year ago and also in January. As the organisations were sharply opposing the move, the company from the South and the Divisional Secretariat officials started to deceive the people one by one promising five lakhs rupees per acre. The officials argued that the people were not going to get their lands as the properties came under the protected coastline since the 2004 tsunami and the deal offered by the company from the South was therefore lucrative. Some fell for the trap. However, the people are united against the mining project, Subramaniyam said. The company has set up an office without any name board, and one Kathirgamathamby is operating from that office for the past six months. Kathirkamathamby is trying to recruit people to sign a document by paying 10,000 to 15,000 rupees per person promising job opportunities, Mr Subramaniyam further said. Even the Government Agent was not prepared to listen to their arguments. “We went to meet the GA twice. The first time, he didn't meet us. When he met us the second time, he wanted only four of us to come inside the office, and he was not prepared to listen to us. He said a delegation would be visiting the area and look into the issue. I asked for five minutes, he refused,” the fisheries association leader says. The deceptive moves have been stepped up during the past six months. “The District Secretary goes mad when we approach him every time. The decision to launch Ilmenite excavation was 9-years old. The time for complaints passed a long time ago and that he could not do anything. Then, he tells us to go and ask Rahulanayaki who was the DS at the time when the decision was made,” Subramaniyam said. The company sent a group a few weeks ago to show a video documentary. When a young Tamil doctor who hails from Kathirave'li challenged the group with documents he had on his mobile phone, the group outrightly refused to look at the evidence. 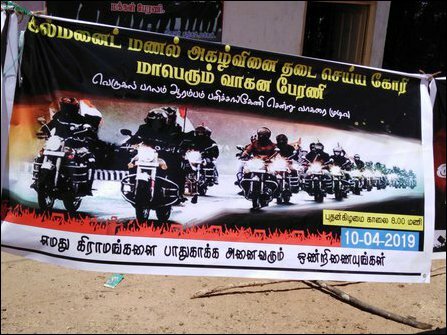 The Divisional Secretary responded awfully, earning the hostility of the Tamil youth. The villagers have handed over an appeal to the Eastern Governor with 1,400 signatures to document their opposition to the project. The grassroots activists also blame TNA politicians for failing to stop the mining project despite their repeated complaints. “Mr Sumanthiran received an appeal from us on Pongkal ceremony at Paal-cheanai. He promised to act. However, we have not heard anything from him. Similarly, Yogeswaran too was not doing enough. A few days ago he came and said he could initiate a case against the move, but it risked winning or losing. What a response,” Subramaniyam said. 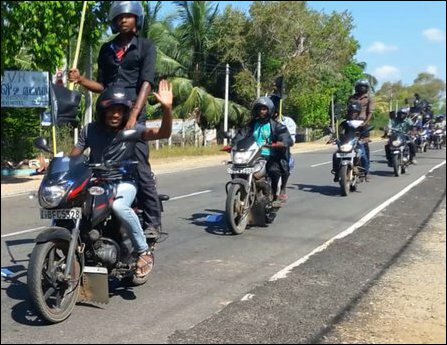 While the TNA Parliamentarian Kodeeswaran was opposing the same kind of project in Ampaa'rai at SL Parliament, none of the TNA parliamentarians representing the Batticaloa constituency have registered their opposition in the assembly, the activist said.